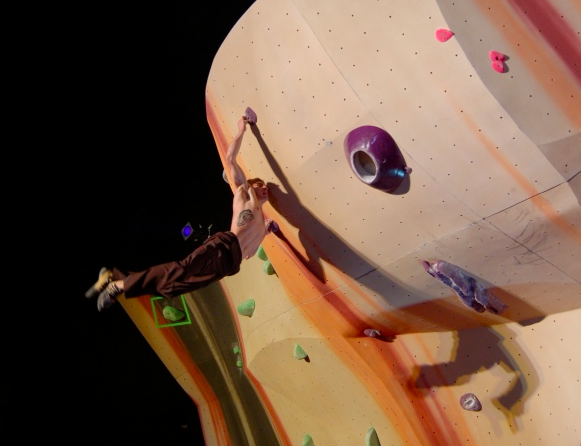 The end of Women’s Qualifiers. 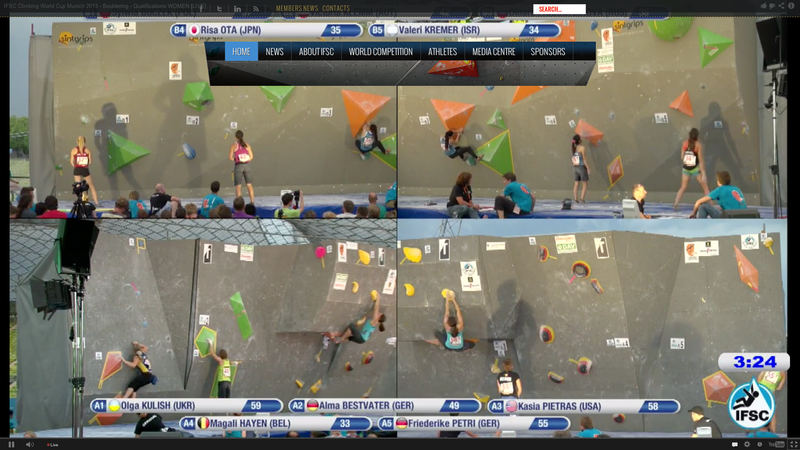 USA’s Kasia Pietras is in the light blue jersey on the yellow problem in both bottom panels. 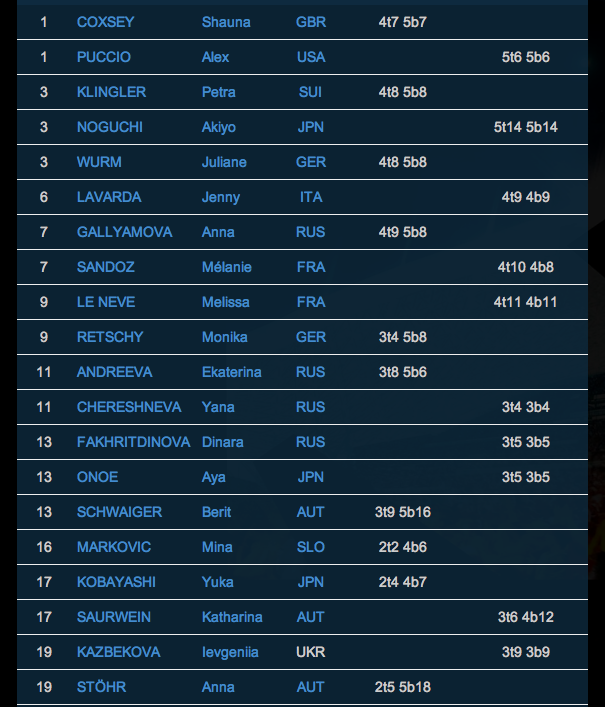 Kasia ended up with 1 flash and 4 bonus holds for 13th in her quali group and 27th overall. These top 20 women from qualis will go to Semis. Puccio did ’em all and nearly flashed ’em all. Akiyo finished them all as well but in 14 tries. The problems looked pretty hard from the bit of women’s qualis I saw. I didn’t see men’s qualis at all. Perhaps most surprising is Anna Stöhr barely making semis–she’s already won the overall with 1st in nearly every event so far this year. She’s spent the WC break climbing outside and just recently returned from a successful trip to Rocklands where she climbed two more 8B (V13) boulder problems. The field looks strong and tomorrow’s semis should be fun to watch. I didn’t get to watch these but clearly Kilian is in top form here with the only 5 sends in the men’s quali. 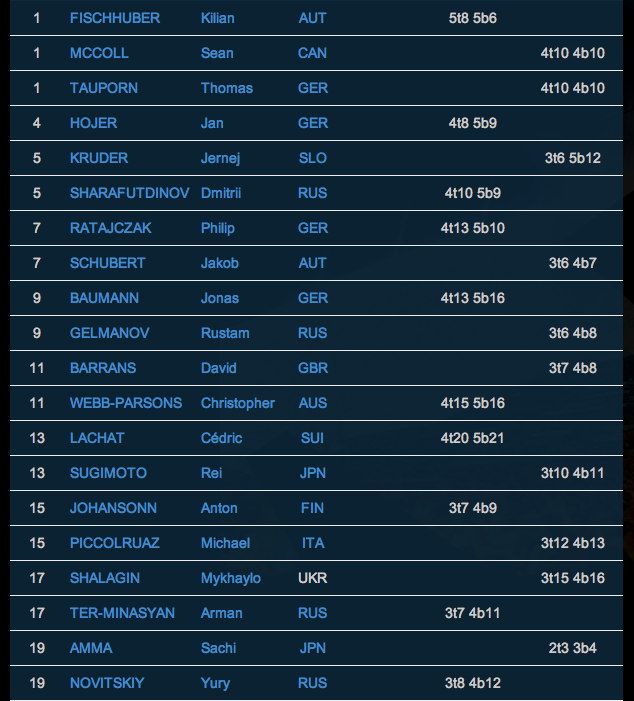 Sean McColl also looks to be climbing well, and mixed among familiar names like Thomas Tauporn, Jan Hojer, Jernej Kruder, and Dmitrii Sharafutdinov are the return of German Jonas Baumann and a bit of a surprise visit from Chris Webb-Parsons who is strong as all get out but usually not the best competitor. Baumann won in Vail a few years ago and Webb-Parsons made finals there but neither has been having a particularly good last two seasons, so it’s nice to see them back. Stay tuned for semis and finals tomorrow!